Tickets are $20 in advance or $25 at the door. Reserved Table of 8 is $200. 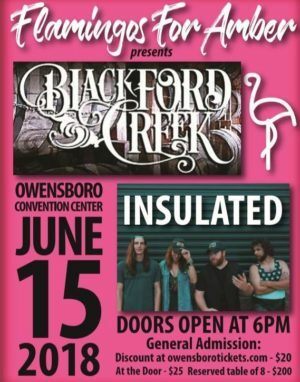 Join us for a fundraising concert featuring music by Insulated and Blackford Creek. Tickets are $20 in advance or $25 at the door. Reserved Table of 8 is $200. Doors open at 6pm and music begins at 7pm. All proceeds go to benefit Flamingos For Amber. To make a donation to Flamingos For Amber, click here.